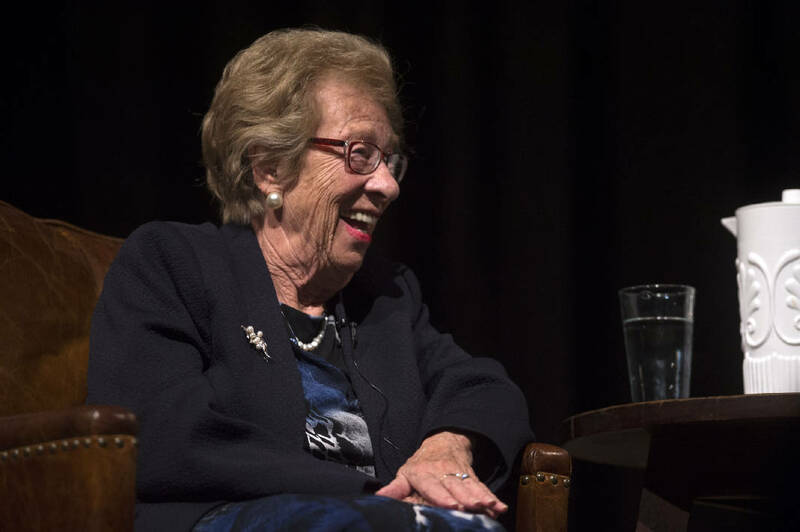 Eva Schloss, a Holocaust survivor and stepsister of Anne Frank, speaks to Hallerin Hill in the Knoxville Civic Auditorium Tuesday, Feb. 21, 2017. 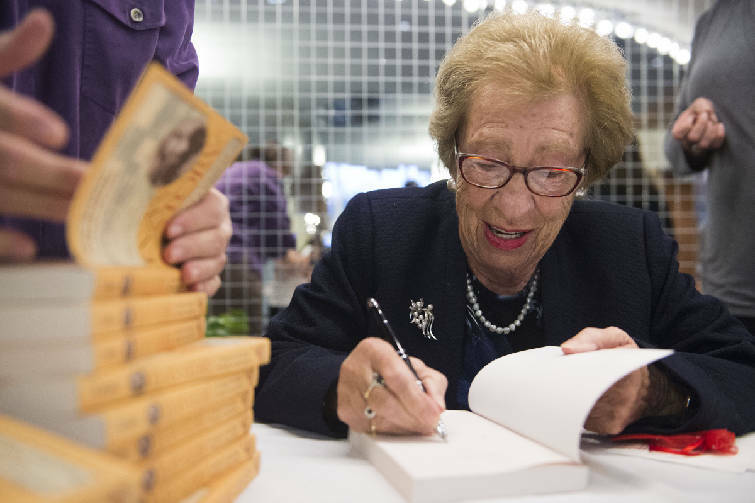 Eva Schloss, a Holocaust survivor and stepsister of Anne Frank, smiles while signing copies of her book "Eva's Story" before speaking in the Knoxville Civic Auditorium Tuesday, Feb. 21, 2017. When she was a teenager, Eva Schloss shared a cot with seven women. Lice, rats and bedbugs scurried among them. Typhus spread. During the daytime, she remembers, the Nazis at Auschwitz were blunt about her purpose. She would work until she died. Or she would starve until she died. And yet, Schloss daydreamed about games of bridge and Monopoly with her family, back before the Nazis found them. "It was an idyllic life," she recalled this week during an interview with the Times Free Press. "I wanted to experience it again. I wanted a boyfriend. I wanted to get married. I was 15. I wasn't ready to die." Schloss, 89, the stepsister of Anne Frank, will discuss her life before and after the Holocaust at Soldiers & Sailors Memorial Auditorium on Sunday night at 7. Tickets cost $25 and are available at evatickets.com or through Ticketmaster. On Tuesday, she will speak to local students in the same auditorium. Schloss, who lives in London, is coming to Chattanooga after stops in Ontario and Nashville. Next week, she will share her experience with a crowd in Memphis. The author of three books, she said she gives these talks because she wants audiences to reckon with the roots of the Holocaust: intolerance. She believes a fear of "the other" explains pain all over the world. She wants the world — America included — to be better. The images on the nightly news hurt her. "I see everywhere refugees trying to escape," she said. "Trying to escape. Trying to get to the other side. I see great hardship. People don't want them. They put them in camps." She sees the same problem in immigration debates. "The Mexican people are good people," she said. "Family people. Wonderful people. Why not give them rights? They work hard. They build buildings. They work in agriculture. Give everybody a chance. If they don't find jobs, they'll leave." "We have been given a wonderful planet with everything in it," she added. "We have beautiful nature. We could all have a happy life if we would tolerate each other and accept each other." Schloss was born in Vienna, Austria, in 1929. Her father ran a shoe factory, and she described their life as comfortable. When she was 9, the Nazis invaded. Her family fled to Amsterdam. She lived in the same neighborhood as Frank, and they skipped and played hopscotch together. Frank seemed confident and advanced for her age. Also: loud. "She was a big chatter box," Schloss said. Frank had lived in Amsterdam for several years and, unlike Schloss, spoke Dutch fluently. She and her friends gossiped about boys. Frank showed literary flourish, writing short, sweet stories about bears and dolls. When Schloss was 13, the Nazis sent a letter to her older brother, Heinz, demanding he board a train for a German labor camp. Instead, the family went into hiding around the same time as the Franks. Finding a home for four people would be difficult, so Schloss' family separated. Schloss and her mother, Fritzi, slept in one home. Heinz and her father, Erich, lived elsewhere. About two years later, she said, a nurse betrayed them. They were eating breakfast one morning when Nazis rushed in. She said they beat her and demanded to know who helped them hide. She said they threatened to kill her brother. Schloss and Fritzi were together in the camp for about nine months. Then, one day, the Nazis departed. Schloss would later learn they were fleeing, that the Nazis knew Russian liberators were on the way. They forced many people in the concentration camp to leave with them on death marches, but Schloss said the Nazis knew she and her mother were too weak to leave. The Russians arrived about seven days later. Months after that, they returned to Amsterdam. She said Otto Frank rode with them. When he got home, he learned his wife and daughters were dead. Similar news greeted Schloss and her mother. According to the Anne Frank House, Heinz died in a concentration camp. Their father died on the death march. Schloss, her mother and Otto Frank remained close. "The Diary of Anne Frank" was published in 1952, and they were swept away by the book's popularity around the world. In some ways, Schloss struggled with the book's reception. She believed people weren't ready to hear the Holocaust's more intense stories, stories like her own. "I was surprised a little bit," she said. "I thought, 'Yeah, I've gone through the same thing. I survived.' I disputed what she said. She still believed in the good of mankind. I sometimes wondered, 'Would she still believe that if she survived?'" In 1953, Otto Frank and her mother married. They lived in Switzerland and spent their days building a legacy for Anne Frank. They answered thousands of letters from readers. They toured the world. Donations poured in, Schloss said, and Otto Frank directed the money to schools and organizations he felt would honor his daughter. "I have never, ever seen a happier couple," Schloss said. "They were really, really in love with each other. They did everything together. My mother was taken with the diary." She kept her own account private for 40 years. But in 1988, she released her first book, "Eva's Story." She had become convinced that strangers could benefit from what she felt.